It's here! Once Upon a Time, the challenge that will always be number one in my heart. Not only because it’s devoted to my favourite genre, fantasy (and fairy tales, folklore and mythology), but also because this challenge is the reason why I started blogging in the first place. I’m going to do Quest the First, and try to read at least five books that fit one or several of the above categories this spring. I won’t force myself to stick to a list, but I thought I’d post a pile of potentials anyway, since (for me at least) seeing what other people are planning to read is half the fun. As I piled these books, I realised this post could very easily be retitled Books Other Bloggers Were Kind Enough to Give Me and I Have Ungratefully Not Read Yet. Sorry all! The King of Elfland's Daughter by Lord Dunsany - A fantasy classic I can't believe I haven't read yet. The Princess and the Goblin by George McDonald - Ditto. The Book of Flying by Keith Miller - A gift from my friend Chris, who swears by it. I hope I'll love it as much as he did. Robin Hood by Antonia Fraser - I bought this book in Nottingham, meaning to read it while I lived there. Two years later, it remains unread. Sigh. Godmother by Carolyn Turgeon - This retelling of Cinderella was a gift from the lovely Nancy. Everyone seems to have strong feelings about the ending, which makes me extra curious to read it. Gasoline by Dame Darcy - A post-apocalyptic fairy tale with wonderful illustrations. I plan to read this very soon. The Forgotten Beasts of Eld by Patricia McKillip - Another gift from a blogging friend, this time Jeane. I always feel so guilty when I take forever to read books that people were kind enough to send to me. It feels inconsiderate somehow. And no, I never think others are being inconsiderate when they don't read books I give them right away, but alas. Anyway, I'll read this soon-ish. I've been meaning to read McKillip for ages anyway. The Language of the Night by Ursula K. Le Guin - Essays on fantasy by Ursula K. Le Guin. What could possibly go wrong? Red Spikes by Margo Lanagan - It's Margo Lanagan. Enough said. The Changeover by Margaret Mahy – a gift from my Secret Santa, Alessandra, and a Carnegie Medal winner. Tales from Moominvaley by Tove Jansson – another children’s classics that I missed growing up. Illyria by Elizabeth Hand – I broke my no ARCs policy for this one because it’s Elizabeth Hand and she’s brilliant. Fairest by Gail Carson Levine – I know it probably won’t be as good as Ella Enchanted, but I suspect it’ll still be good enough to make me happy. Skulldugery Pleasant by Derek Landy – this was highly recommended to me by several trusted blogging friends. Best-loved Folktales of the World edited by Joanna Cole – a gift from my friend Debi. It’s too long for me to consider reading it all (besides, I think folk and fairy tales work best in small doses), but I do hope to dip into it here and there. Have you read any of these? What did you think? Where should I start? I thought I’d also take this chance to officially join two challenges I actually joined long ago, but only in my head. First, Lu and Jason’s Clover, Bee and Reverie challenge, which is devoted to poetry. 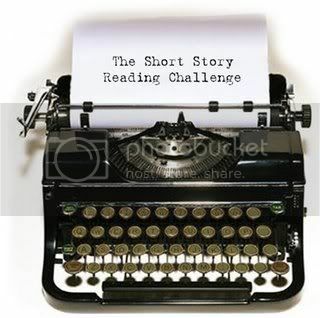 Secondly, Kate’s Short Story Challenge. For Clover, Bee and Reverie I think I’ll read the two Mary Oliver books I own, some Emily Dickinson, and perhaps also some poetry that’s available online – more Sylvia Plath? Christina Rossetti? Anne Sexton? Billy Collins? Do you have a favourite poet? Do you know of a poet you think I'd love? I'm more than open to suggestions here. I can hardly wait for you to read the Patricia McKillip! And Lord Dunsany....I've read the ones you have on your pile. I'm just about to post my own list for this challenge too. It's fun to see what others are reading, you're right, that is part of the fun! that and the gorgeous artwork Carl seems to find. I so want this year's picture, I love it! Happy fairy tale and fantasy reading, Nymeth!! PS forgot to mention - about the poetry contest - I think I know about one of the Mary Olivers you're going to read, what's the other one? I'm reading "Red Bird" at the moment. I don't think she's written a bad poem yet.....do you want to do something together? I'll email you. Susan, yes, do e-mail me! The other Mary Oliver book I have is exactly Red Bird, which Debi was lovely enough to send me. Between the two of you, I really AM going to become a Mary Oliver fan :P It's lovely to hear from you, and I can't wait to see your OUaT list! You have a very interesting list there. And I'm also a big fan of Elizabeth Hand. She writes so beautifully, doesn't she? Seriously we should read/review The Book of Flying together! I've got it on my shelf too and am really looking forward to it! Where do u get such fantastic books! My lord! I have not even heard of them! I am sure I like this genre but not read much in it. But the time this challenge is been hosted is going to be v. busy sadly, so I will have to miss thing one this time. Welcome to Short Story Challenge, I am in it too! Oh my I have never read Sayers also! Well will look forward to your reviews! I hope you will read Forgotten Beasts of Eld -- I read it first at the impressionable age of 12 or so, and love it. Time for a reread! Also, I haven't read The King of Elfland's Daughter yet either, and must rememdy that. have fun Nymeth. Great choices, and your cat is too cute! 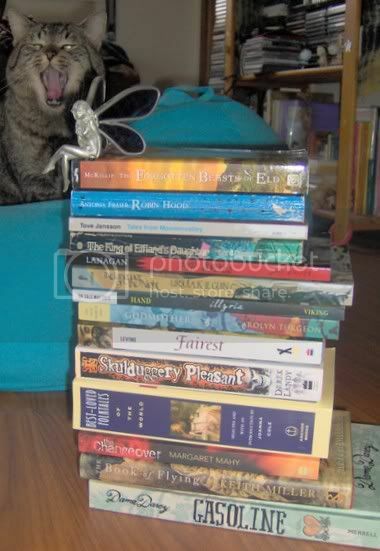 Is the cat about to eat the fairy? The Changeover is a lot of fun and a great read. And Chris has said such great things about The Book of Flying I really should try and get a copy in time to read during the challenge! OMG Moomins! Le Guin and Mahy are two of my favourites, and Red Spikes is amazing. Fantastic list - this is gonna be the bestest challenge ever. I should join this challenge because I think for me, it is one that would be very easy to complete :-) But... no more! Mostly because I'm too lazy to write a sign-up post! Have fun with the challenges! I'm wondering if your cat is yawning or yowling in that picture. This is one area of my reading that has been grossly neglected for years and I am hoping to remedy that. I hope to complete one book for this challenge, but to be inspired to read many others. I have put Le Guin's book of essays on my library list as a place to start. Have fun! I'm trying hard not to join. I have so many reading commitments. Look at you reading seminal fantasy things that are seminal. :) I've never read anything by Lord Dunsany but was mightily unimpressed with George McDonald when I tried him as a kid. Maybe I'd like him better now. XDXDXDXDXD "Red Spikes"! I have that one! I got it last week(ish)! Good luck with the challenge, Nymeth! I have to admit that all of the books you have picked sound very interesting to me, and I will be very anxious about seeing what you thought of them. I hope you enjoy each and every one! wow that's quite a list! I've only heard of Skullduggery so I will be interested in all of your reviews! I just finished The Princess and the Goblin a week or so ago. It's excellent, and strange, very strange. Of course, Moomin stories are also pretty strange. Your copy of The King of Elfland's Daughter looks exactly like mine, dings and scratches and all. I am not joining this challenge, because one is enough! But maybe next year. We'll see if I manage to complete the one I've signed up for. Speaking of which... another poet I think you might like is Michael Ondaatje. His collection Handwriting is just stunning, but something like Elimination Dance is short and fun and thought-provoking, too. And last but not least (I'm really being a little long-winded here, aren't I? ), I CAN'T WAIT TO SHOW MAXIDOODLE THAT PICTURE!!!! A post-apocalyptic fairy tale? That sounds like something I need to hear more about. Thanks for putting a Pedrez picture on here. I can send you a picture of my cat if you want. And one of my sister's cat. Thank you Ana. If I may be so bold, give Jhumpa Lahiri a try for the short stories if you haven't read her yet. She is a master of the form! Ooh, Ursula LeGuin, ooh Antonia Fraser, ooh The Princess and the Goblin! Two wonderful wonderful writers and a book that's lying around here somewhere, unread by me (hmmm). And if you are following your heart with the poetry and short story challenges, and reading Christina Rossetti's Goblin Market, then you must follow it with Anne Sexton's Transformations (poetry); Margaret Atwood's Bluebeard's Egg(short stories); and anything by Angela Carter. But you probably know all of them. Sorry. Wow! This is quite the list you have! I'm sure you will enjoy them all. Good luck with the challenge! Looks like fun! I want to comment on all of the lovely books you have to read for the challenge but I can't get past how darn cute your kitty is! Oh look at that pile of books you've selected for the challenge! I have GODMOTHER in my TBR. Have fun with the challenge, Ana! Oh, McKillip and Le Guin, and I can't wait to hear what you think of Elizbeth Hand's new book. I'm very excited about OUaT and reading everyone's reviews. Have great week. Yusef Komunyakaa! One of my all-time favorite poets. & Derek Walcott! I'm so glad you're going to be reading some poetry with us! A great pile of "possibles" for the Once Upon A Time challenge - I hope that you enjoy the ones you pick and I really must get around to pulling together my pile! I doubt if I can get one of my dogs to look as brilliant as your cat does though! I love the photo! and the list. I will join too, of course, but I doubt I'll manage to finish it...but half the fun is in making up the list! Alas, but I haven't read a single one of your potentials. I'm really interested in the Robin Hood book, though; he was my childhood hero, and I've been meaning to read more about him for ages and ages now! Someone after my own heart. Glad you feel as passionate about fantasy, fairy tale and folk tales as much as I do. Lovely blog here, found you over at Technorati, which I'm new to. I'll be putting you on my blogroll. I love The Princess and the Goblin--it really is a classic you should experience. Fairest was disappointing, at least for me. There's no comparison to Ella Enchanted. I liked Fairest better than Ella Enchanted, but my all-time favorite is The Two Princesses of Bamarre. Maybe it depends on the order in which they're read. Two Princesses was my first Gail Carson Levine. After a while, all her books seem just a little too similar. I love the yawning cat!! We have a big old kitty boy under our futon. His mama wants to get rid of him and she seems to be a bit of a blockhead so my husband wants to take him on to save poor Desmond from a worse fate. We'll see how the kitties get along. So far, Desmond just wants to hide. Anyway, hope you like Godmother and enjoy your reading! Good luck with the challenges, Ana! 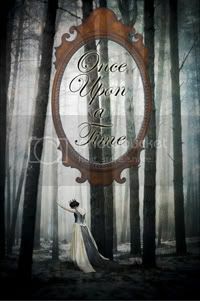 I haven't read any of the books you list for the Once Upon a Time Challenge, much less heard of many of them sad to say. I look forward to seeing what you do end up reading and what you think of those books. So many good books! I liked so many of George MacDonald's Curdie books when I read them a long time ago. I've always been meaning to read the LeGuin essays, and the Dunsay- do read that one first so I can learn more about it! And don't feel guilty about not reading the book I sent you yet! I've got so many sent me by other bloggers and I've only picked up one or two so far. I don't want to take a lot of time, but just a quick note to say thanks for joining Clover, Bee and Reverie. I can't wait to see your reviews :). Also, I'd go with Margo Lanagan. I haven't read any of the listedbooks. But she's Margo Lanagan ;P.
A few of these books are on my Wishlist, I'll be interested to read your thoughts on them. all the best with the challenge. I think I may have to break my "no more challenges" rule and join this so I can read some fantasy too! Sounds like fun. Amanda: I have a few books to finish before I get to it, but I'll let you know! Veens: Many were gifts, others random finds, and others...I don't even know :P That's a pity you won't be able to join the challenge, but there's always next year. Melwyk: lol :P And yes, the McKillip is one I'll make sure I get to, as I think she's an author I could really love! Aarti: Come on, just one more ;) I'm sure Carl won't mind it if you skip the sign-up post. Molly: I hope we both enjoy Le Guin's essays! Whitney: Fairest does sound like it'll be great fun - I just need to remind myself not to expect another Ella Enchanted. Kiirstin: Thank you so much for the poetry recommendations! I'll keep them in mind. Kailana: I'm sure you'll be able to at least complete The Journey. Good luck! Megan: Yes! And with wonderful illustrations too. Jenners: Oooh - I loved Interpreter of Maladies but have yet to get my hands on The Unaccustomed Earth. Thank you for the reminder! ds: I've read and loved your suggestions, which only means you know me well by now :D But I still haven't read everything by Carter, and I've been meaning to return to Bluebeard's Egg - it was my first Atwood, and I think I'd appreciate it better now. Alice: I hope we both enjoy Godmother when we get to it! Gavin: I'm very excited as well! Everyone has such great lists. LU: *adds both to list* Thank you! Valentina: Ah well...finishing schminishing :P It's all about considering the possibilities. Memory: I loved the 80's or early 90's TV series that was always on when I was little. I can't believe I've yet to read a single Robin Hood book! Jeanne: I'm hoping that going in with lower expectations will allow me to enjoy it still. Nancy: Yes, I can definitely see how her books would be samey after a while - which is a pity! And aww, poor Desmond. I hope he's a little less scared today. Rebecca, do! It'll be fun, and Carl's challenges are always so relaxed and pressure-free. Love your Once Upon a Time stack!! I'm hoping to read Fragile Things and also TEnder Morsels. Also want to read THe Gormenghast Trilogy, if at all possible. Claire, I loved both Fragile Things and Tender Morsels! I considered Gormeghast too, but I hear it's quite a demanding book and I'm not sure if now would be the right time for me to pick it up. I look forward to your thoughts, though! As for Whitman, I haven't read much by him at all. I really should, though, shouldn't I? Especially after Paper Towns. The Forgotten Beasts of Eld was the first McKillip I ever read (in middle school! ), and I've been in love with her ever since. I think it's a great introduction to her work, and that you will be hooked ever after, too. Her use of language is just amazing. I'm still making my list so I came to see what you were reading and to get some ideas. Think I'll look for the Le Guin, I've heard of it before and thought it sounded interesting. I thought maybe Robin Hood would be in the library, but no. I do hope you will love the Moomins - I love them so much I read the books to my husband when we were first married. Been bad about checking blogs lately... how did I miss this post?! Anyway: The Princess and The Goblin is one of my FAVORITE BOOKS OF ALL TIME. I love it SO much. I have a lovely old-old edition with terrific illustrations, from my grandmother (it might have been my dad's?)... I love this story so much. You must read it. Please? We have that folktales book here at home as well. I don't think I've read it yet. And: LOVE the kitty in the background. Bored now! Please feed me.